A two-room apartment for maximum 4 persons, with seaview and air conditioning. The apartment has a living room with a sofa bed for 2 persons, TV with satellite and radio/cassette/CD player. Bedroom with a double bed, kitchen, bathroom and a very sunny balcony. This apartment is equipped with: air conditioning, washing machine, microwave, juicer, blender, coffee maker, iron and ironing board, TV with satellite, baby bed, etc. Bed linen and towels included with weekly changes. 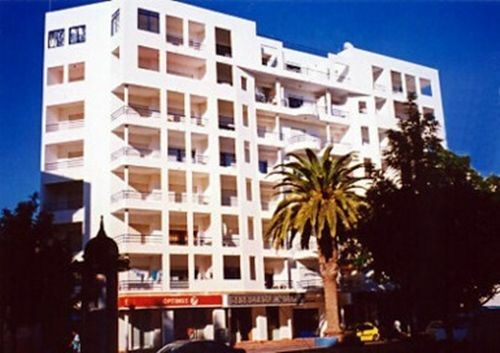 The apartment is situated on the seventh floor (2 elevators) of a seven-storey building in the town centre of Quarteira. The distance to the beach is approximately 300 meters. Quarteira is situated on the beautiful coast of the Algarve and is about 20 km west of Faro airport. It is a picturesque fishing village with little alleys, a nice boulevard and wide sandy beaches. It is very close to Vilamoura with its international golf courses, a harbour and a casino. Over the last few years, Quarteira has become a famous tourist centre that offers all possible facilities for a perfect holiday. We spent a great week, the apartment is very well organized, practical. We were very well received which is very important. Nous avons passé une très bonne semaine, l'appartement est très bien agencé, pratique . Nous avons été très bien reçus ce qui est très important.